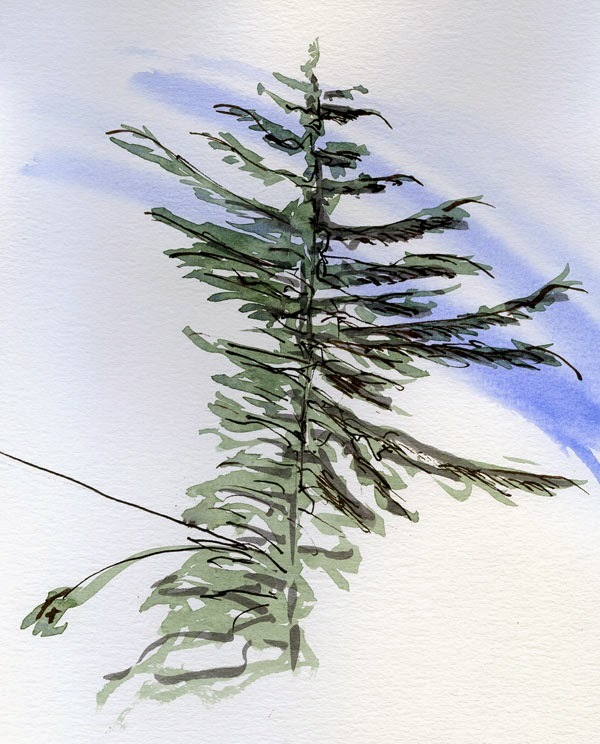 This type of evergreen, which is plentiful in these parts but which I don’t know the name of, is difficult for me to sketch because the usually dense branches form dark fir-y masses in the center that taper out to feathery ends. 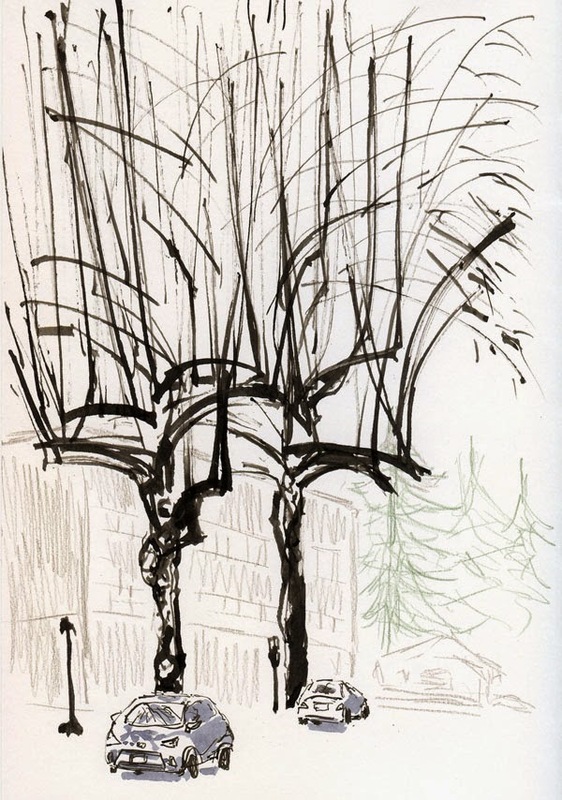 I practice often on the ugly, misshapen tree visible from our bedroom window; in fact, I just practiced this morning (see below and my post last October). 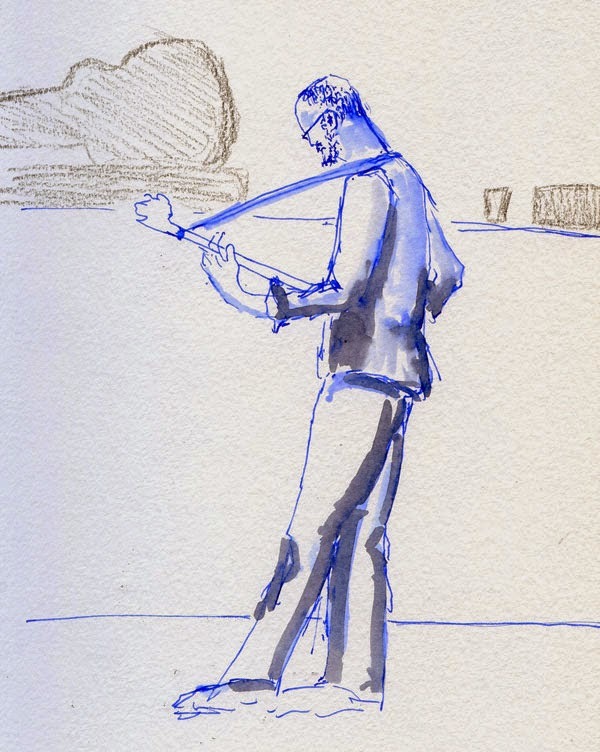 While sketching most of the day at Wintergrass, the annual multi-day bluegrass festival, I discovered a particular challenge of sketching jammin’ musicians: all those foreshortened limbs! 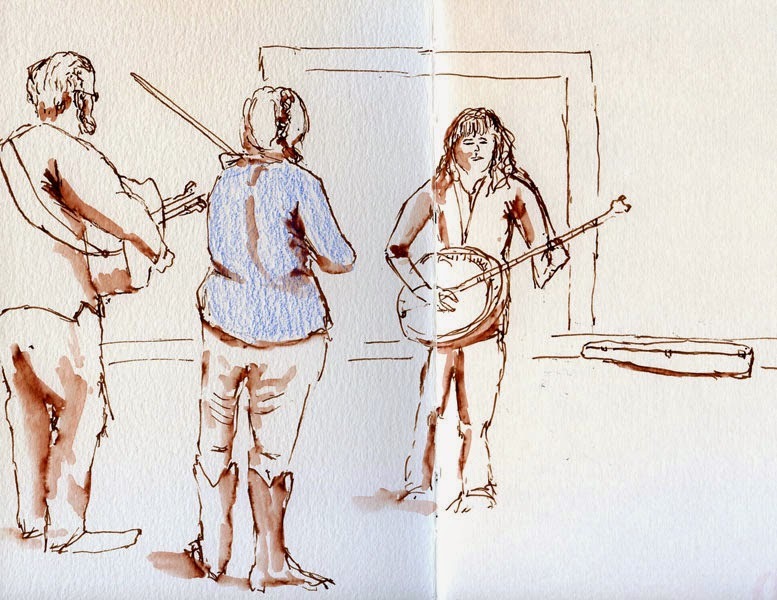 But I love bluegrass, and there’s nothing more fun on a drizzly winter day than sketching to terrific music in a comfortable indoor venue. 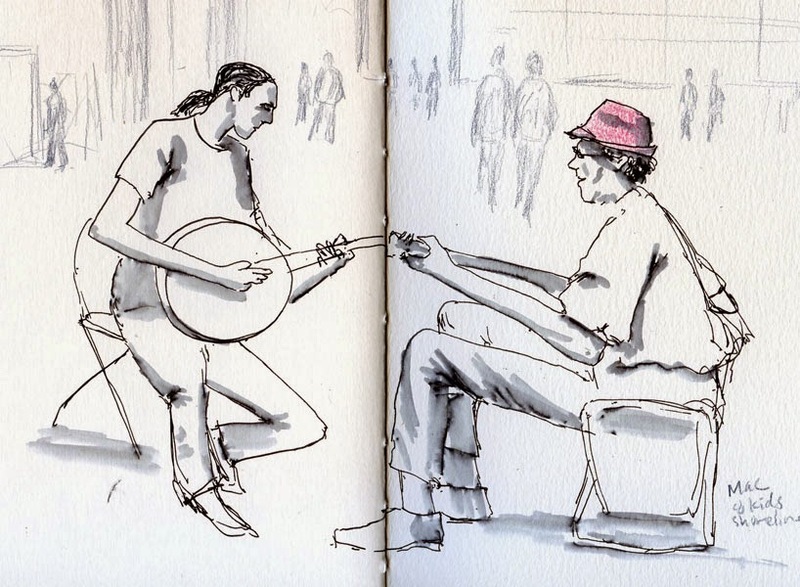 Last year, it was one of my favorite Friday ad hoc Urban Sketchers outings, and this year was even better. 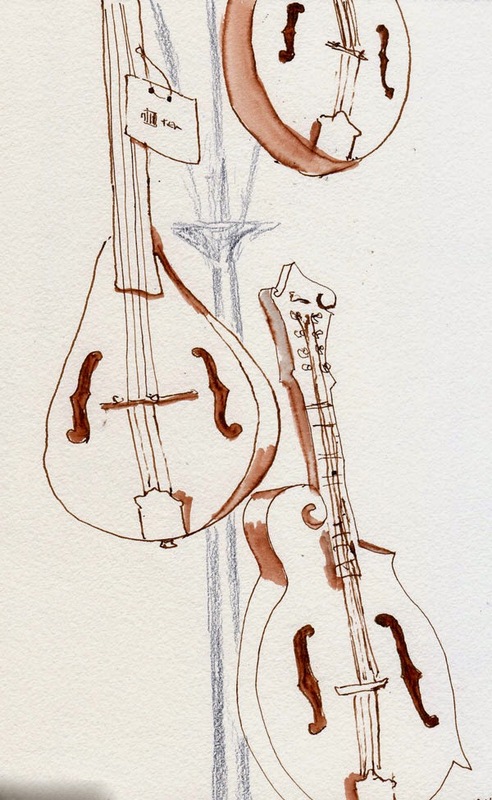 In addition to scheduled concerts and lots of impromptu jamming, the festival offers lots of booths where vendors are selling various stringed instruments, including some lovely mandolins I sketched. 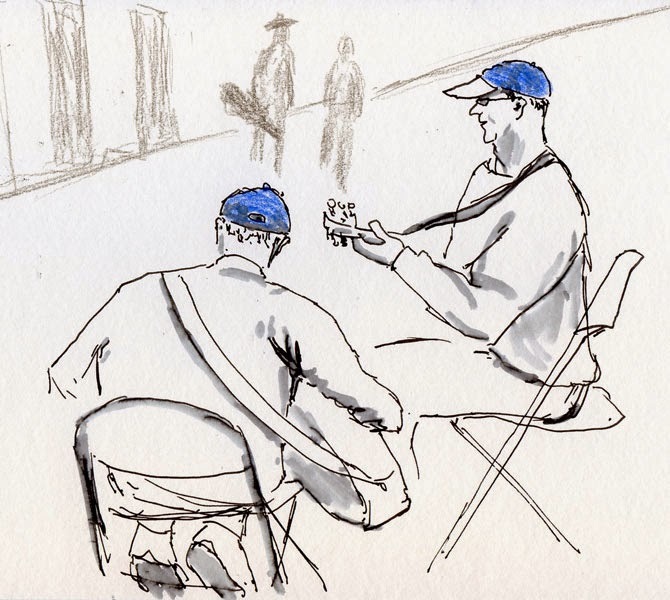 Shoppers were encouraged to sit and try out instruments, and thankfully those players were slightly slower-moving sketching targets than jammers. 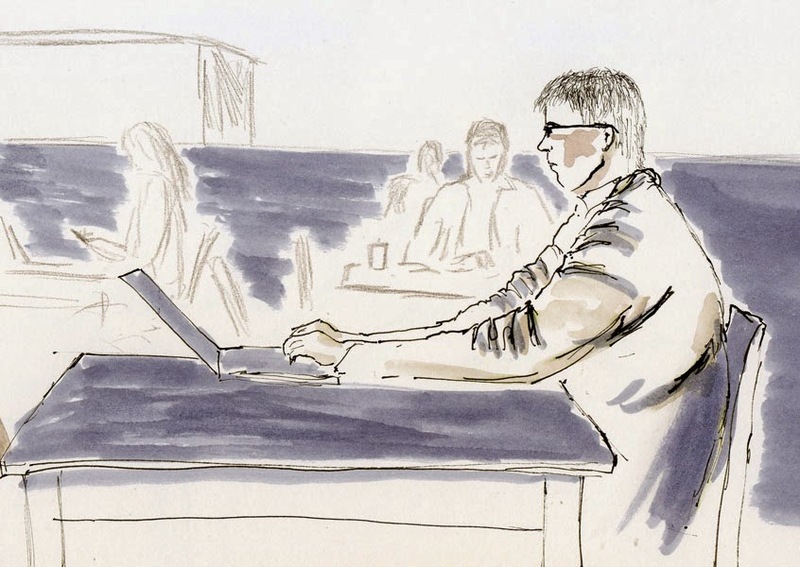 After sharing our sketchbooks, most of us took a break for lunch, and then Natalie and I stayed for more sketching in the afternoon. It’s a good thing we did, because we bumped into Michele, who couldn’t come in the morning. 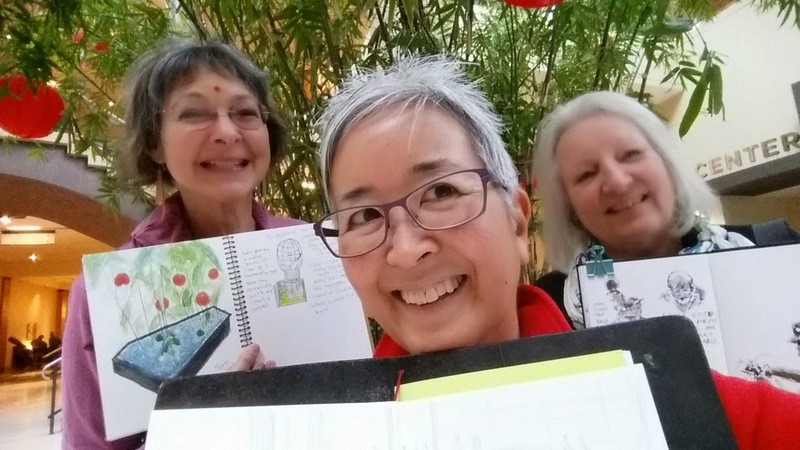 Since a group of three sketchers constitutes a sketchcrawl, we took a selfie. Natalie, Tina and Michele at the post-sketchcrawl mini-sketchcrawl. Walking back to my car after a haircut, I passed two blossoming trees. One had brighter peachy-pink blossoms with cupped petals; the second had flatter, pale pink petals and dark reddish-brown leaves. I would have said the second was a cherry, but I always think of cherry petals as having a small, wedge-shaped cut on its outer edge. Perhaps it’s a different variety. I wanted to sketch a few more, but then it started raining again. Yes, I did color these on location. 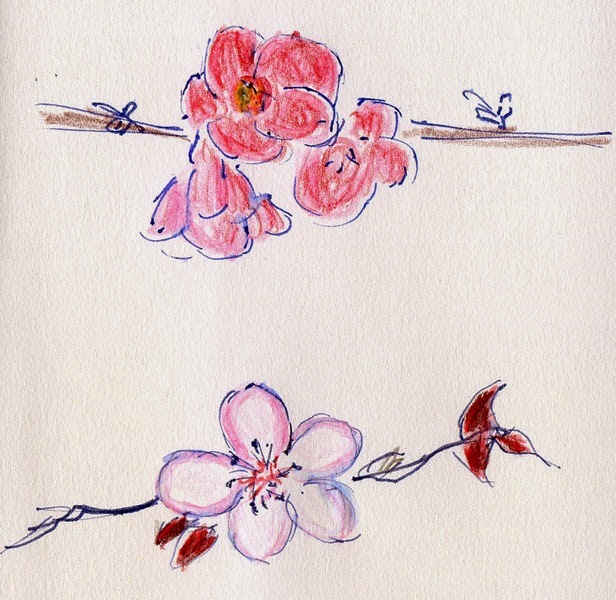 Just like I always keep bright green and red markers in my bag during the holiday season (in case of an unexpected Santa sighting), I always keep a pink colored pencil in my bag as soon as I’ve spotted the first blossoming cherry. It never hurts to be prepared. 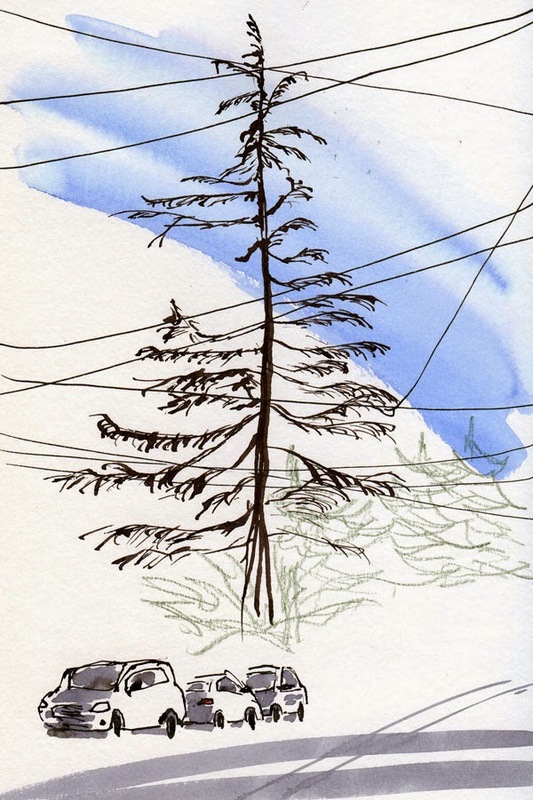 Two trees side by side in Shoreline: one with the unfortunate “power line haircut,” the other full and proud. It just goes to show: It’s not who you know; it’s who you happen to be standing next to. It’s not exactly what I would call “warm” out there (our thermometer reads 49 F), but the spotless blue sky – such a treat in these parts – called to me. I popped the top off my car, cranked up the heat and cruised over to the Wedgwood neighborhood. 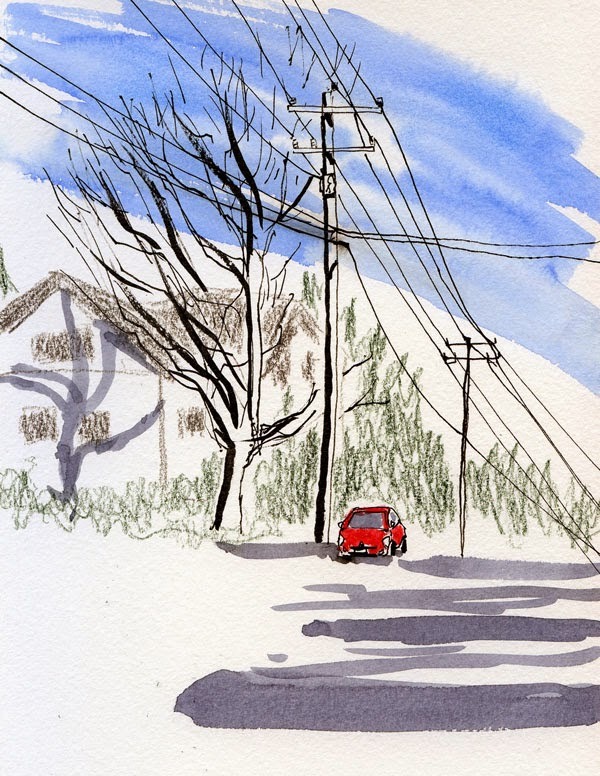 A bare tree, a couple of power poles, a few dark blue shadows in the street – it takes very little to make me happy on this otherwise ordinary February day. Eye candy galore at the L.A. Pen Show. 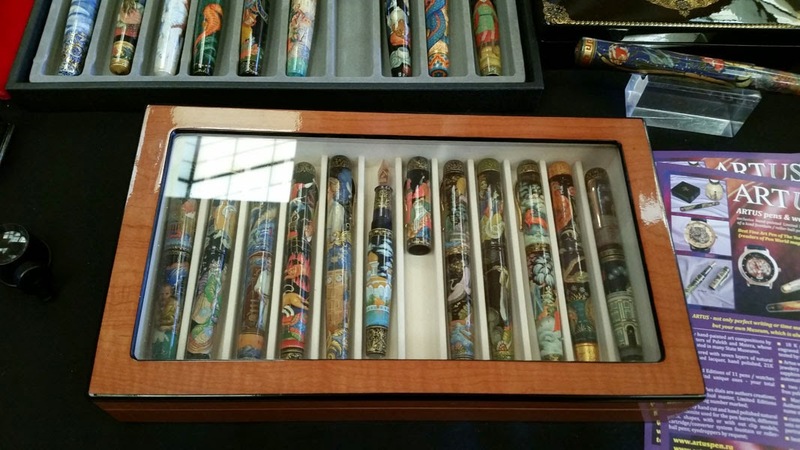 Held at the Manhattan Beach Marriott, the show was wall-to-wall (mostly fountain) pens, ink, paper and other stationery products as well as a variety of apparently peripherally related products such as pocket knives, cigar humidors and cuff links. (I’ve never figured out why fountain pens are such a male-dominated industry, but as a female in attendance, I was definitely in the minority.) 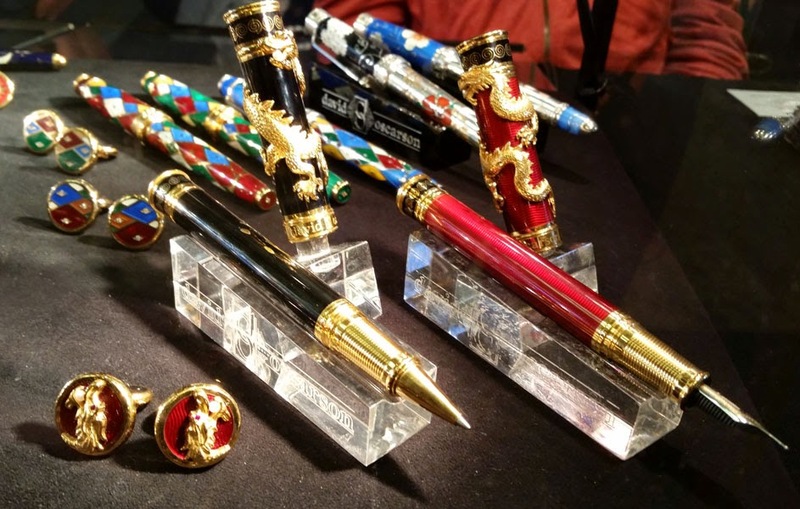 Needless to say, fountain pen eye candy was everywhere! 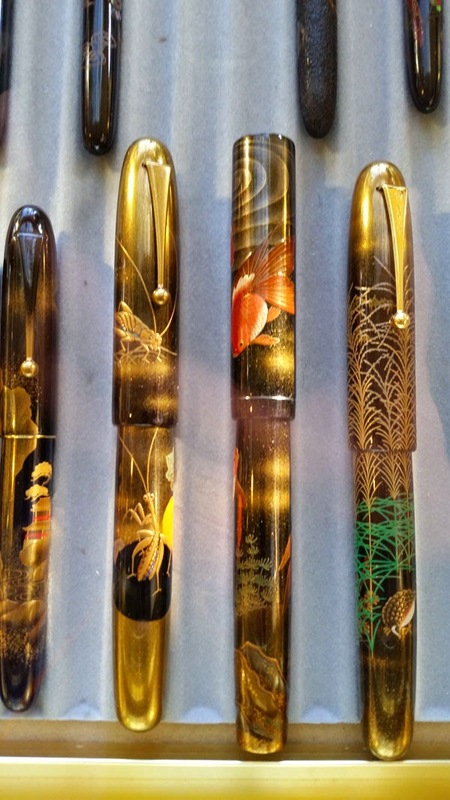 I have never seen so many gorgeous – and expensive – fountain pens at one time. My intention in attending the L.A. Pen Show, however, had nothing to do with shopping or ogling; I had a sole purpose: research! I was hell-bent on finding a vendor that carried unusual nibs, especially those made by Sailor, that would allow me to give those nibs a try. 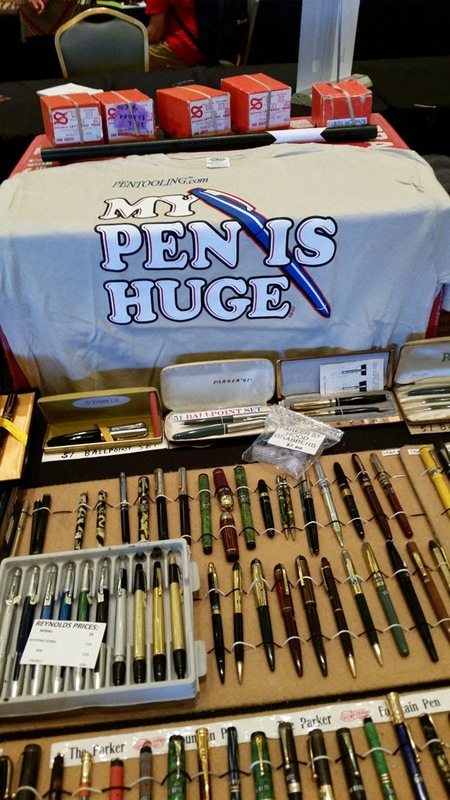 That vendor turned out to be Classic Fountain Pens, better known online as Nibs.com. 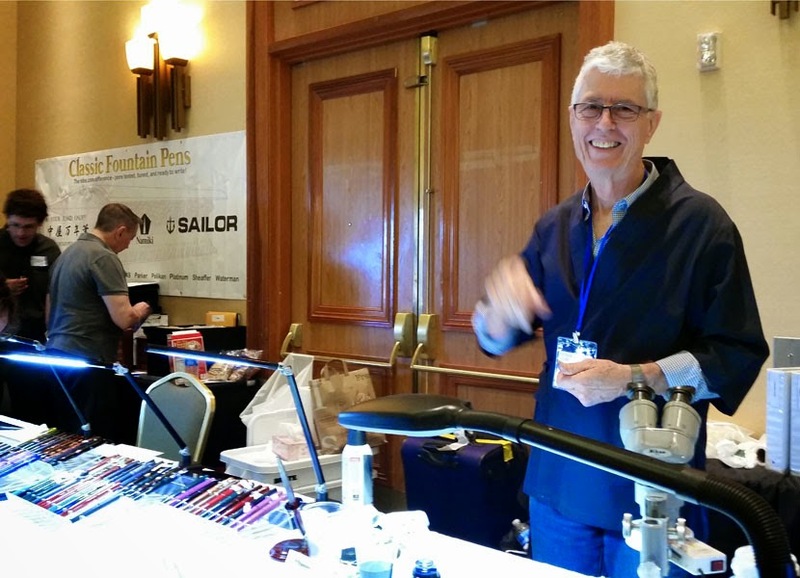 Before visiting his booth, I had met Nibs.com proprietor and nibmeister John Mottishaw at his presentation, “Making a Nib Sing for You.” John talked about how he came to his 20-year career in fine-tuning fountain pen nibs and answered attendees’ questions about fixing troublesome nibs. In some cases, after hearing someone describe a problem, John would put on his super-magnifying eyewear or whip out a jeweler’s loupe to make a nib adjustment on the spot. His wit and sense of humor entertained us. 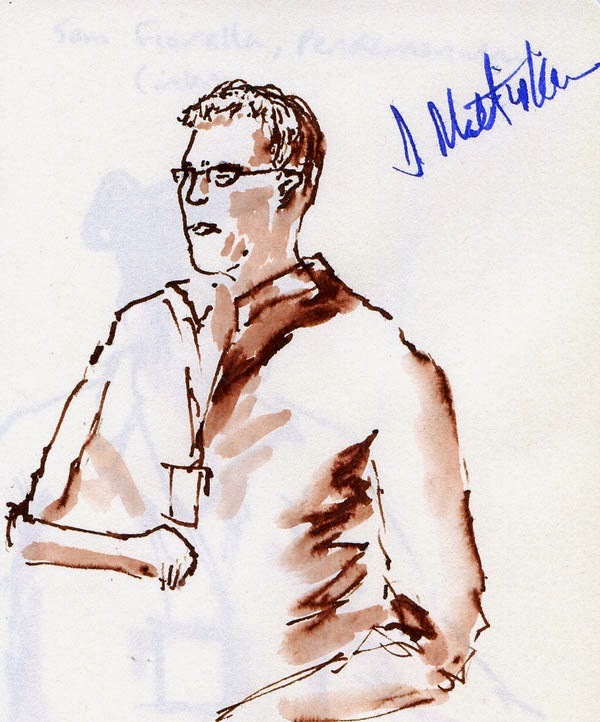 Impressed with John’s knowledge and experience, I left the presentation with a higher regard for the craft in general. adjustments to attendees' troublesome nibs. The next day, after spending the first couple of hours blinded by the dazzle of all those pens, I finally stumbled upon Classic Fountain Pens’ booth, where I found what I came to L.A. for (other than my family, of course): Nibs.com offered a huge variety of pen nibs that attendees could try. In addition to most of Sailor’s exotic nibs, samples of John’s own custom nib variations (such as the famed Mottishaw Spencerian grind) were available to test. This time, with the staff’s encouraging permission and informative answers to my questions, I sat at Nibs.com’s booth for more than an hour making small sketches with each Sailor nib as well as some of the Mottishaw custom grinds. These nib tests were not only fun; they were immensely illuminating (see all samples at the bottom of this post). 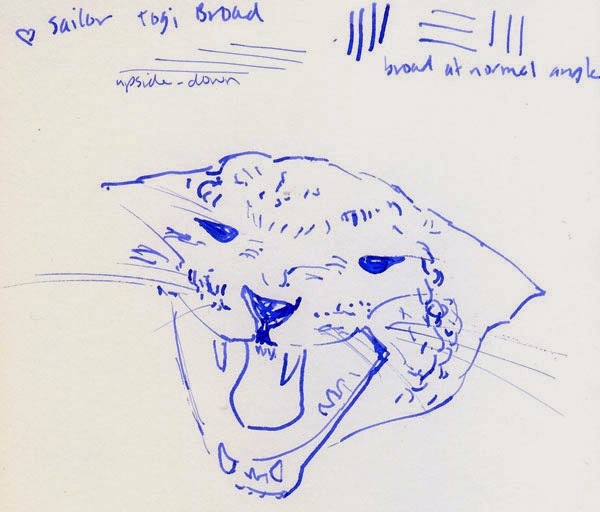 I’d seen (in videos) and read so much about Sailor’s many specialty nibs that I had come to form opinions about their potential appropriateness for sketching without having touched them – and I was surprised by the reality in almost every case. For example, the 21kt gold fude that I have been lusting after for six months didn’t feel quite as smooth as I had expected, at least in some stroke directions (my beloved steel version isn’t the smoothest pen either, but I had somehow expected the gold version to be smoother). 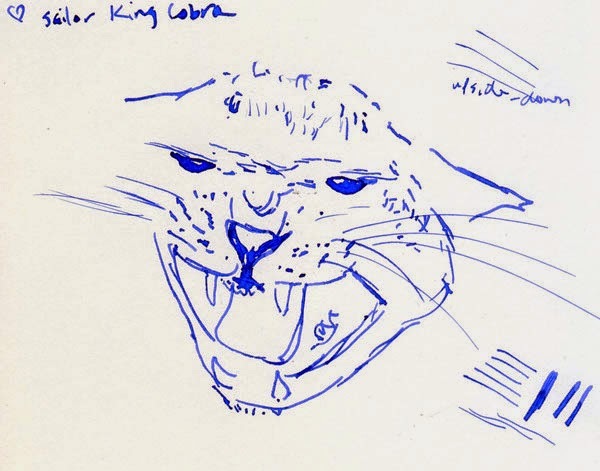 A couple of other specialty nibs I hadn’t even considered, such as the King Cobra and Cross Point, blew me away with their varied line widths and smooth operation. Rather than confirming what I thought I knew, the nib tests gave me a whole new set of variables to consider! Dying to know what I bought at the show? Amazingly, I managed to leave L.A. without making a single pen purchase. However, Nibs.com is now bookmarked on my browser, and my grail search suddenly has more (and more expensive!) possibilities. Meanwhile, my epic series continues with the other pens I already own. Stay tuned for the Platinum music nib . 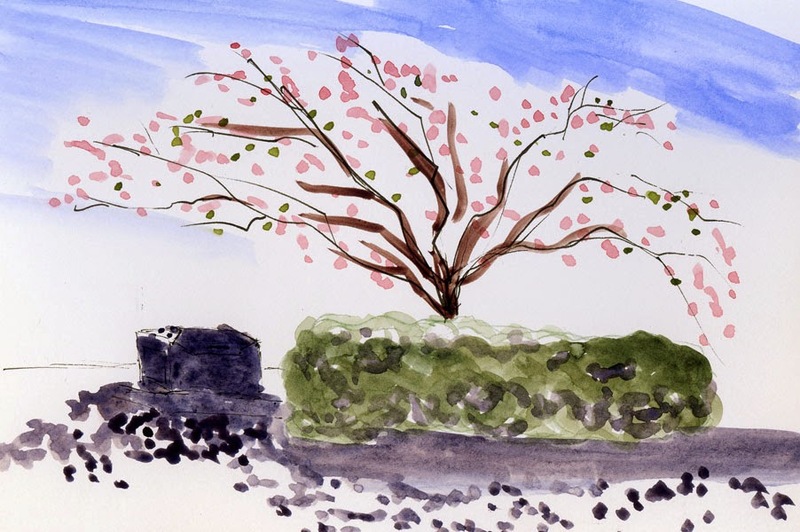 . .
Encouraged by the season’s first blossoming cherry tree on Tuesday, I went out today looking for more pink to sketch. I saw a few trees in bloom, but most were still full of buds tightly closed. I’ll give them another week or two. 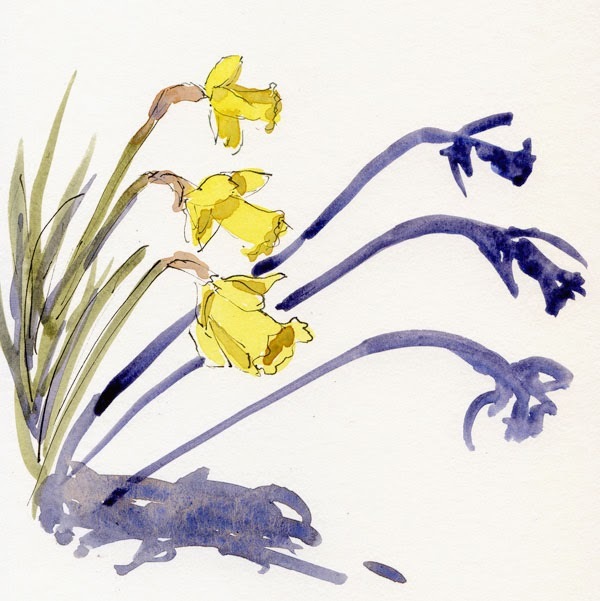 When I got back home, I spotted another harbinger of spring, this time in yellow: our neighbors’ daffodils casting late-afternoon shadows on the rockery. Technical note: After trying out a couple of signatures of Fabriano Studio hot-press paper, I decided to go back to cold-press Canson XL after all. 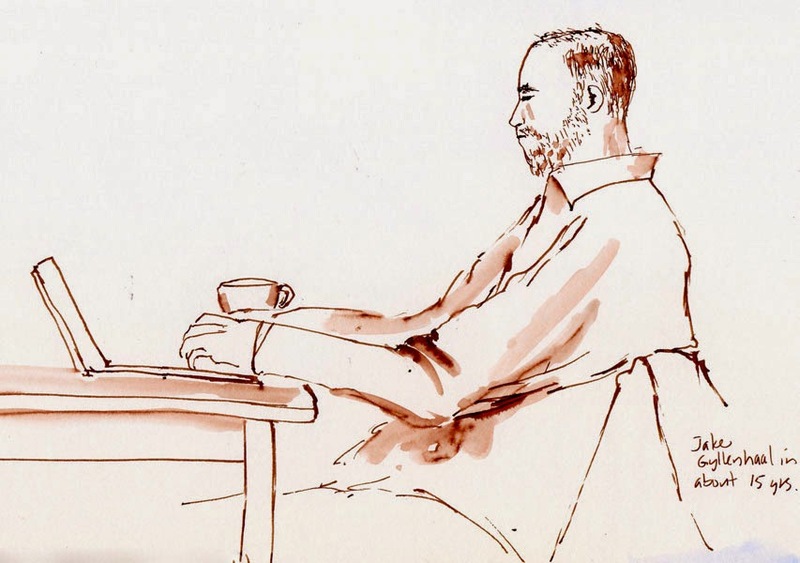 Although I do like hot press for pen and ink sketches, I still prefer the texture of cold press with watercolor. Canson XL has definitely become toothier than I like, but I’m going with the devil I know. The Pacific Science Center is showing Pompeii: The Exhibition, a fascinating collection of artifacts unearthed from the city that was buried under Mt. Vesuvius’ ashes in 79 A.D. 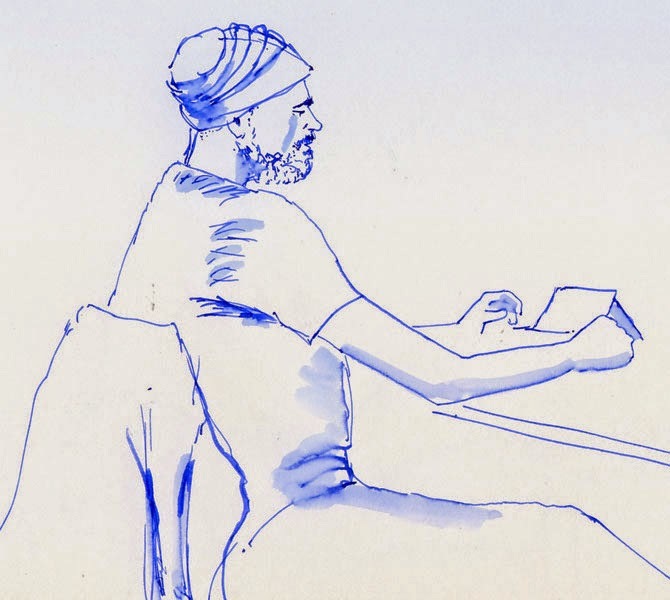 In addition to architectural features, domestic items, art and other objects that have been recovered, the exhibit includes short CG-animated video programs showing what life for the residents of Pompeii might have been like. 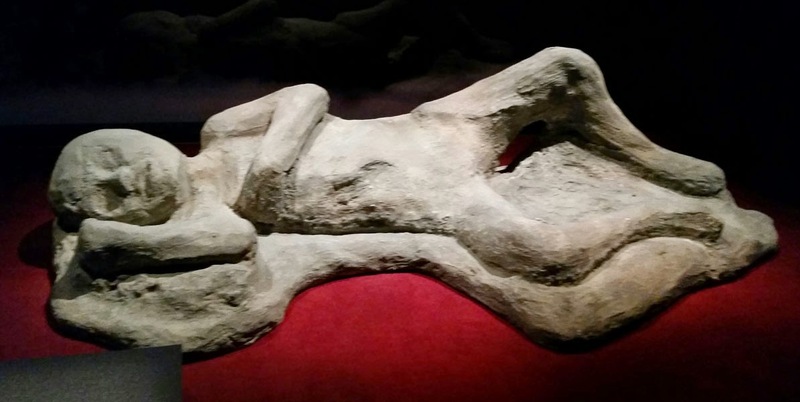 Although the artifacts were interesting, what I found most moving was the resin replicas of casts made of individuals who had been instantly killed by the volcanic eruption, the form of their bodies perfectly preserved through the centuries. Seeing the remains of the way they lived seemed commonplace compared to seeing the way they had died so suddenly in an explosion of fire and ash. 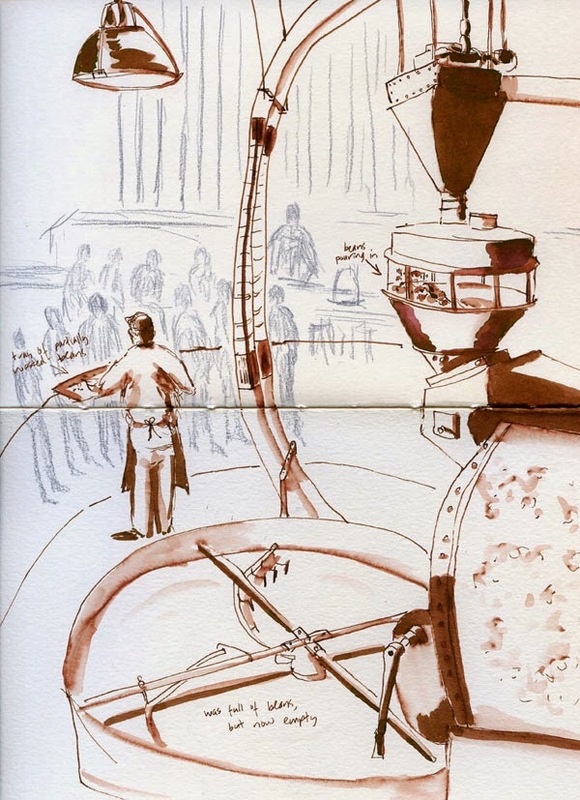 Unfortunately for me, it is the type of exhibition that attracts so many people (“Final U.S. 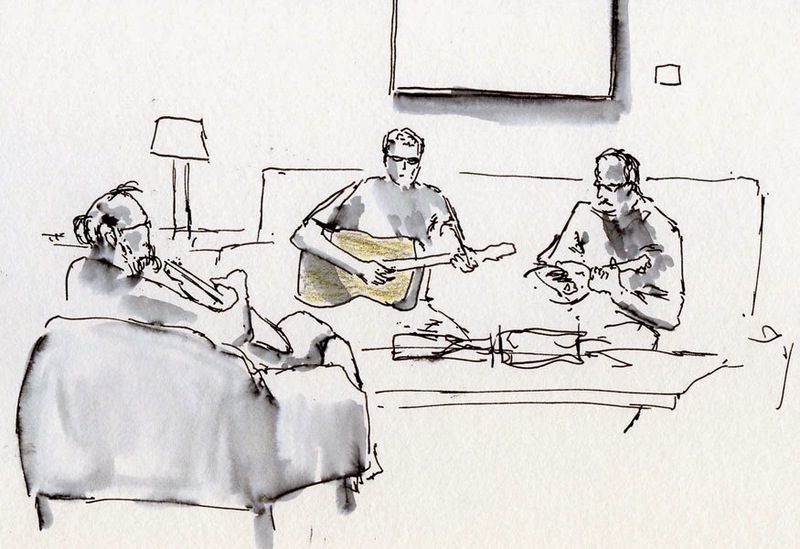 Showing through May 25!”) that we were herded through each room without much space or time to sketch. I saw a number of sculptures I would have liked to capture, as well as the cast replicas of the bodies. 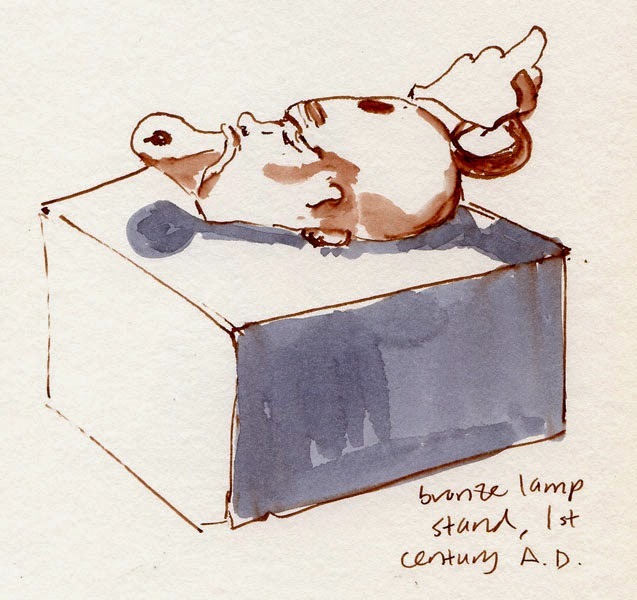 Alas, all I managed to sketch was this small bronze lamp stand in the shape of a man’s head. The exhibit ends with information about the several active volcanoes around Seattle, including Mt. Rainier, less than a hundred miles away. water-soluble colored pencils, Fabriano Studio 140 lb. Perhaps Seattle has an arborist named Dr. Seuss. 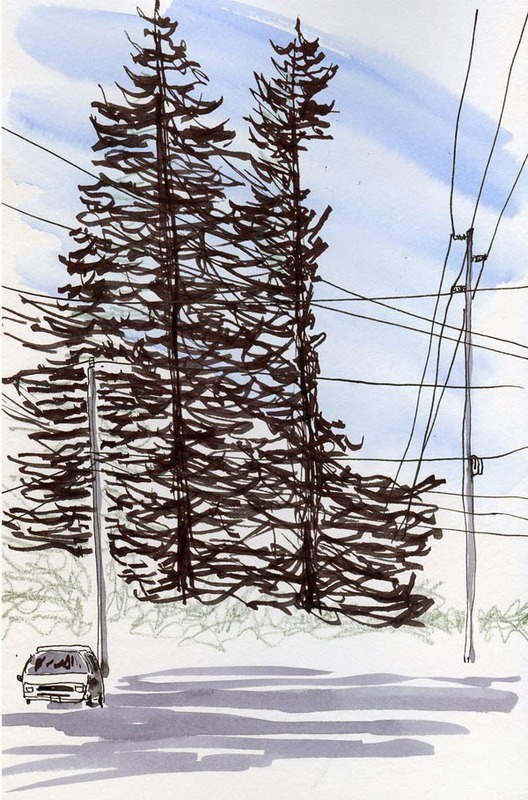 You’ve seen my ongoing sketch series of trees that have been butchered to accommodate power lines. Growing in front of Bryant Elementary School are several very tall trees that have been pruned in the weirdest way, but here’s the clincher: That street has no visible power lines at all. I’m sure the arborist had a reason to hack away the wide limbs that probably would have reached all the way across this relatively narrow street, but I can’t imagine what it was. Meanwhile, the branches have decided that if they can’t spread outward, they will grow straight up. The cherry (plum?) tree in front of the library is beginning to blossom! I discovered last year that this particular tree is among the first to bloom in my ‘hood, so I was planning to watch for it, but I wasn’t expecting to see it this early. This isn’t my favorite composition – that ugly book-drop bin next to the tree is a bit distracting – and if I’d waited until this afternoon, the light would have moved from the back to the front, but I got so excited that I couldn’t wait. Spring is on its way! 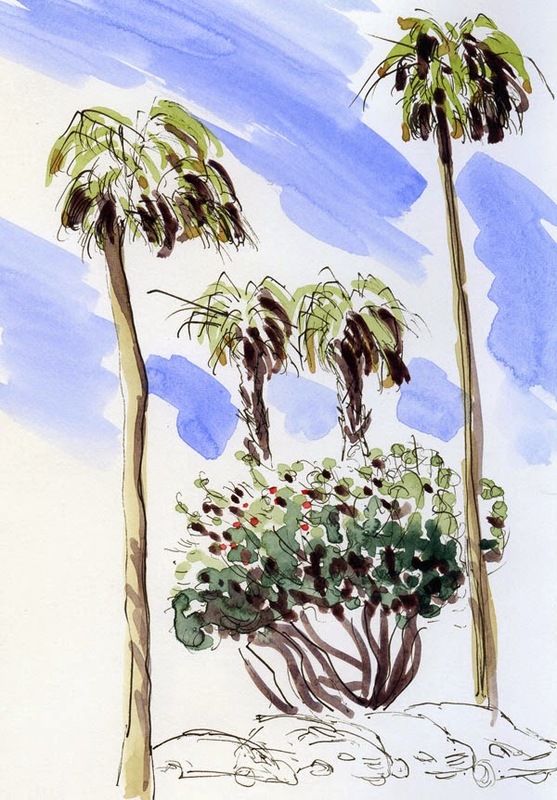 In L.A. for the weekend visiting family, I didn’t have much time to sketch, but I couldn’t leave without capturing these quintessential palms. The temperature was in the 70s and low 80s without a drop of rain predicted for the foreseeable future. 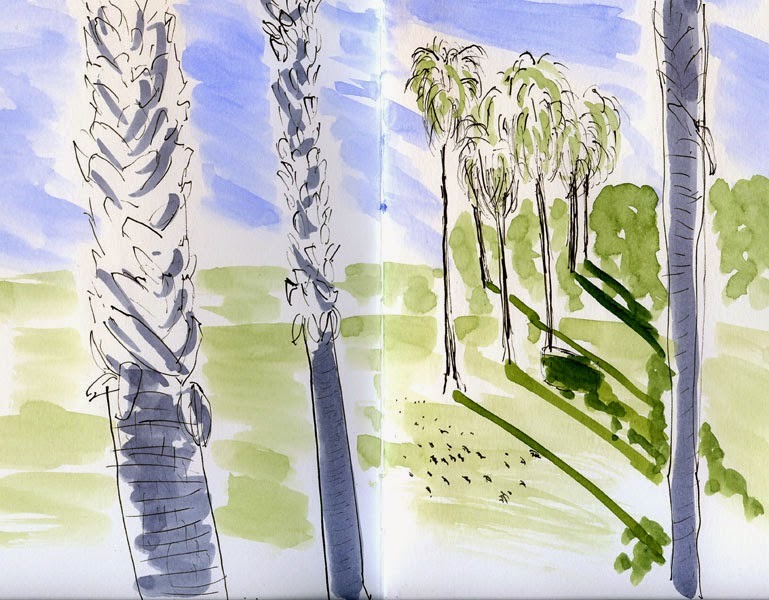 We should feel sorry for their drought-devastated landscape, but in mid-February, it was pure delight to sketch in the sun. 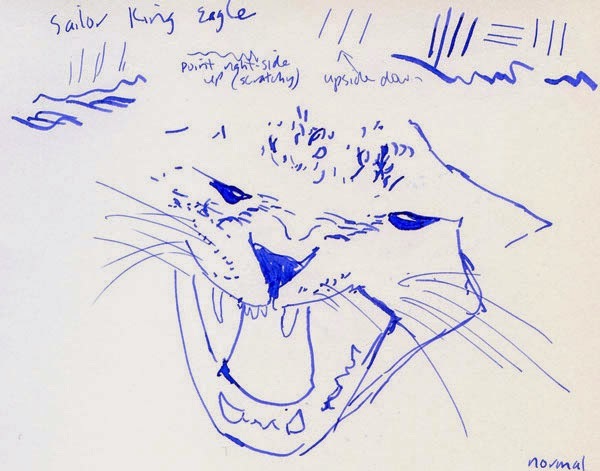 Long before my research of music and flexible nibs began, I had briefly tried a couple of different so-called semi-flexible nibs: the Noodler’s Ahab and the Platinum Cool. I found that I had to apply so much pressure to get either of those nibs to flex that my sketching line immediately lacked fluidity. Perhaps the degree of flex these nibs offer is enough for writing with a variable line, but I couldn’t get them to work for sketching. 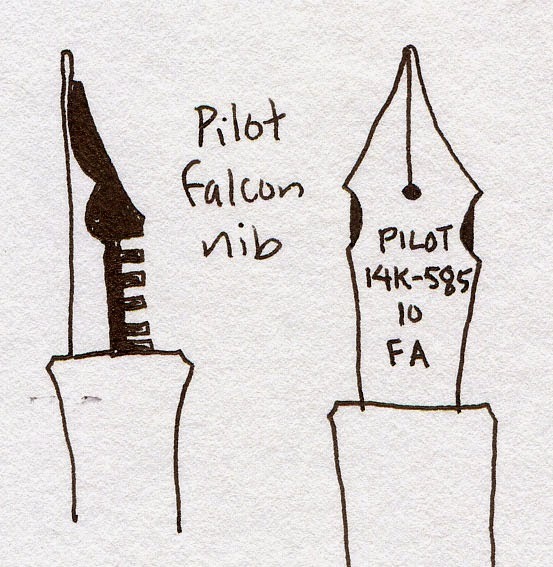 The Pilot Custom Heritage 912’s Falcon (FA) nib is a whole different story. (If you missed last week’s post, it’s important to note here that the Pilot Falcon (FA) nib is different from the Namiki/Pilot Falcon pen, which has a much stiffer, less flexy nib. Yes, I know it’s confusing.) While still not as soft as a vintage “wet noodle,” the 14kt gold nib is certainly soft and flexible enough to produce variable widths without having to exert an unnatural degree of pressure for sketching. As soon as I got it, I filled it up with waterproof Platinum Carbon Black ink and took it out for its maiden flight. 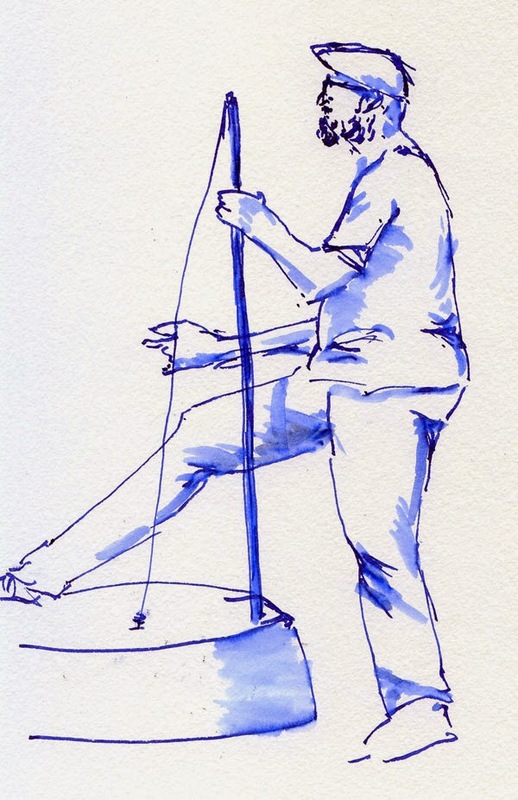 Immediately I noticed that the nib puts out a ton of ink – the proverbial “fire hose,” I learned that it’s called – even without applying any pressure, and when I did apply pressure to make the line heavier, I could see that the ink flow was fast and heavy, which means it takes a significantly longer length of time to dry. 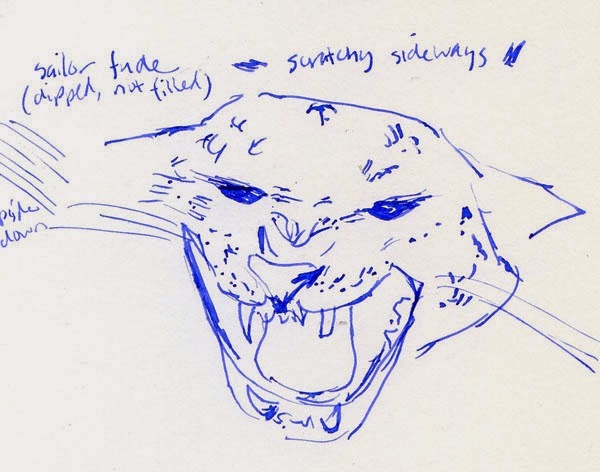 (I didn’t know this at the time, but I learned shortly thereafter that flexible nibs require a generally heavy ink output to keep up with the sudden additional flow needed when flexed; otherwise, when the flexed tines split, they leave an uninked space in the middle, called “railroading”). Writing samples done with Pilot Custom 912's Falcon nib. 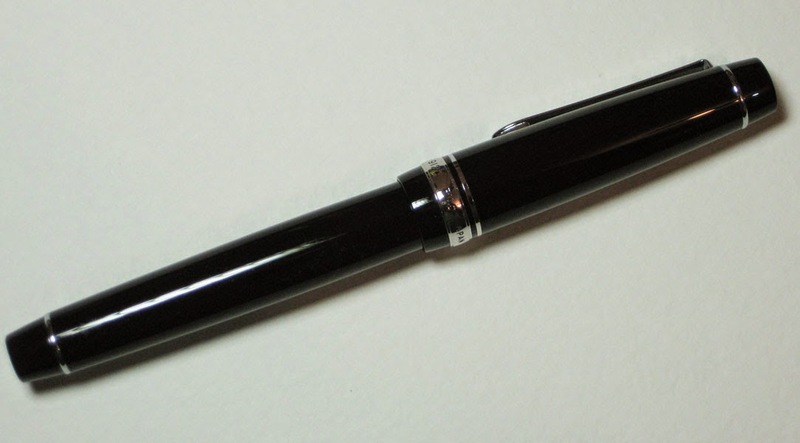 In addition, the Pilot Custom Heritage 912 flows beautifully, immediately and consistently. 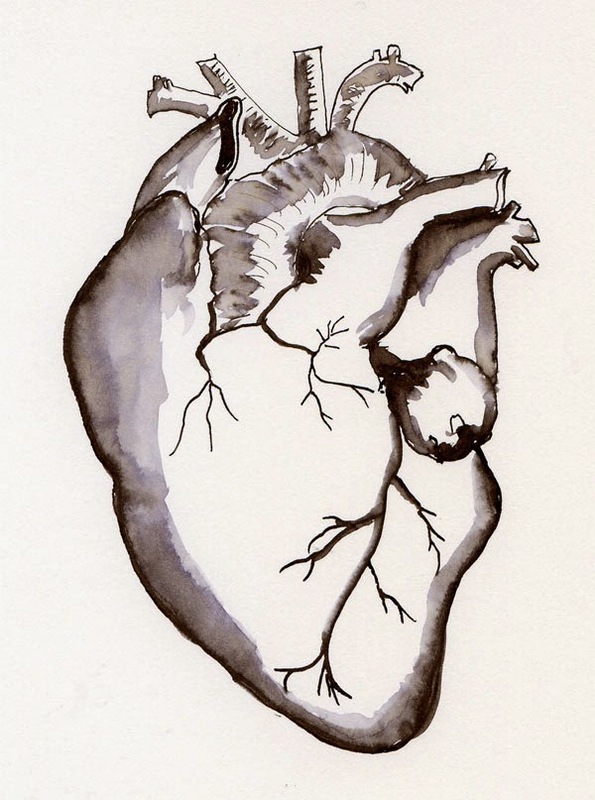 Even with that plentiful stream of ink, it never leaves a puddle. 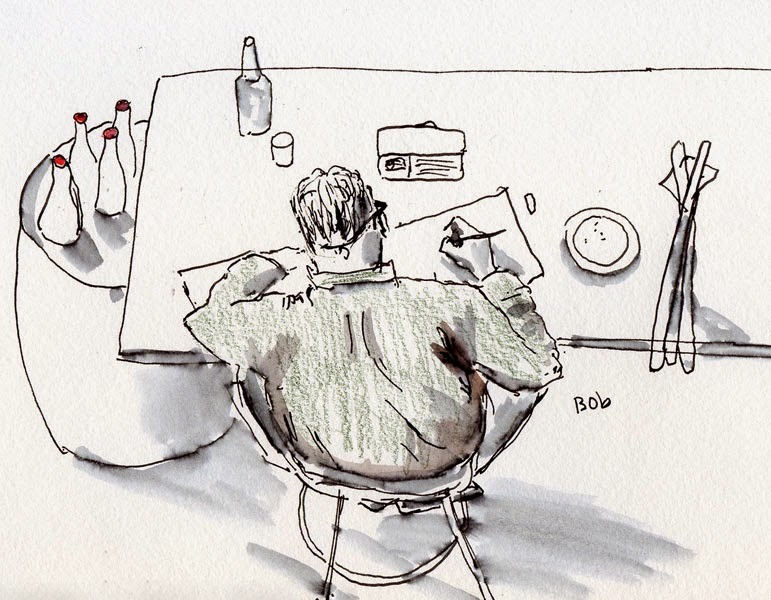 I love simply writing in my journal with it (but since it lives in my sketching bag, I rarely do). 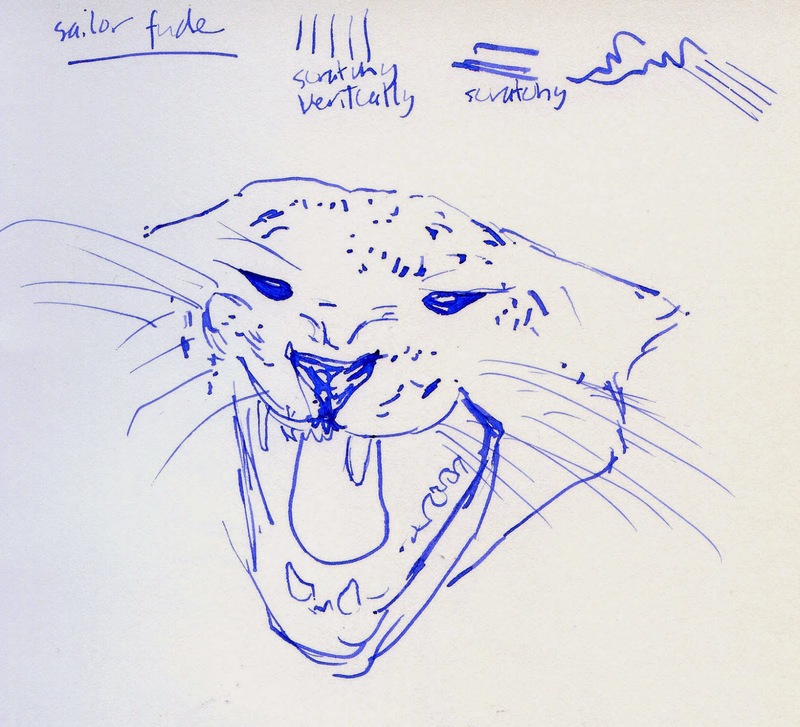 As for the flexiness of the nib, how does it respond while sketching? When I want a medium-to-broad line, the flexy nib responds immediately, and that fire hose output of ink keeps up with me just fine. 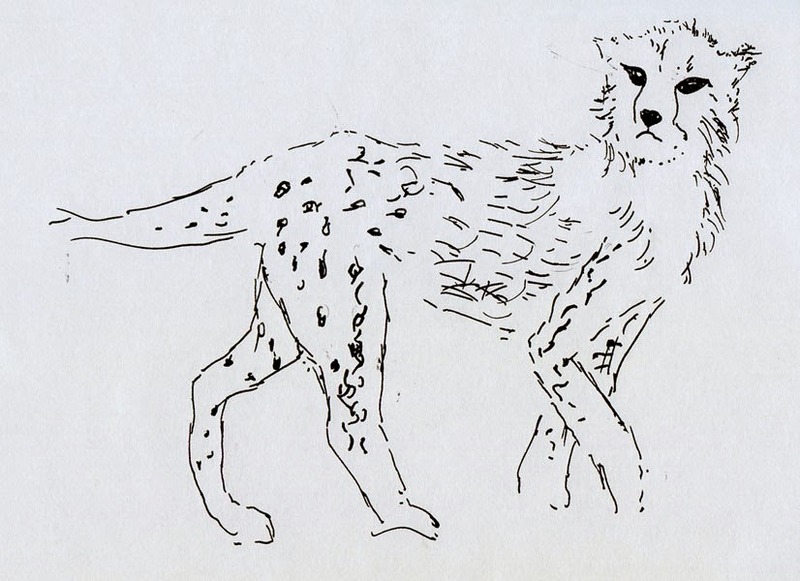 On the other hand, its finest line – which I get by turning the nib upside-down, because even the lightest of pressure produces a line that is a little too broad for my definition of a fine line – still isn’t as fine as the finest line I can get with my old trusty Sailor fude (note the fur around the baby cheetah’s head, below). 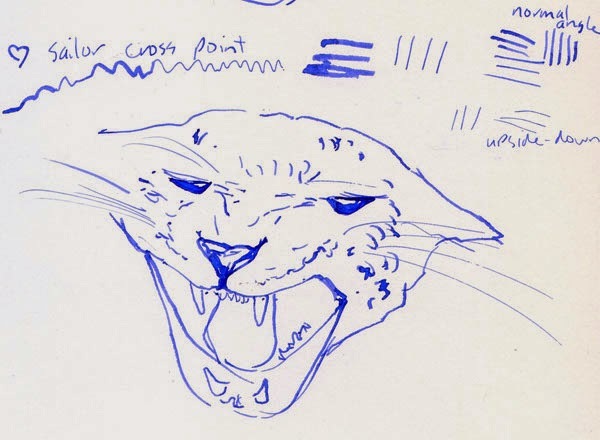 And when I want broad areas of ink, such as on the cheetah’s spots, the old Sailor makes nice wide marks easily with single strokes, while the Pilot Falcon nib (at right) requires making circles and filling them in. 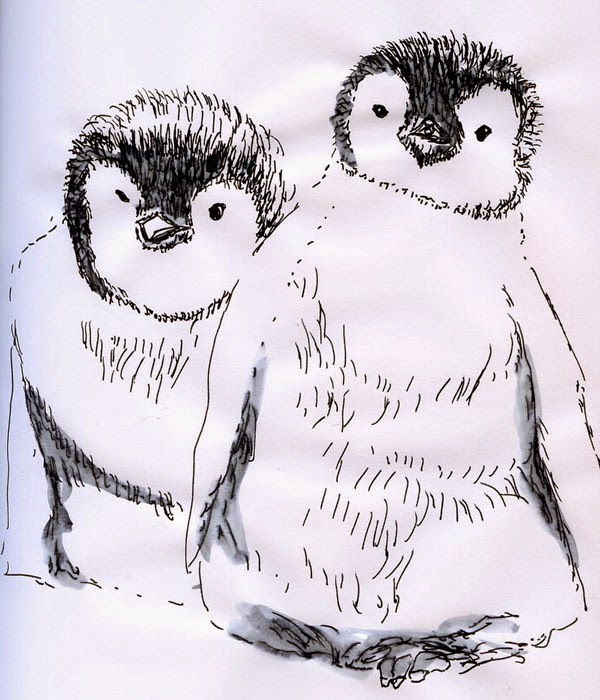 One issue that I discovered almost immediately is that the soft, flexible Falcon nib can snag on the toothy surface of cold press paper – splattering ink on the page. 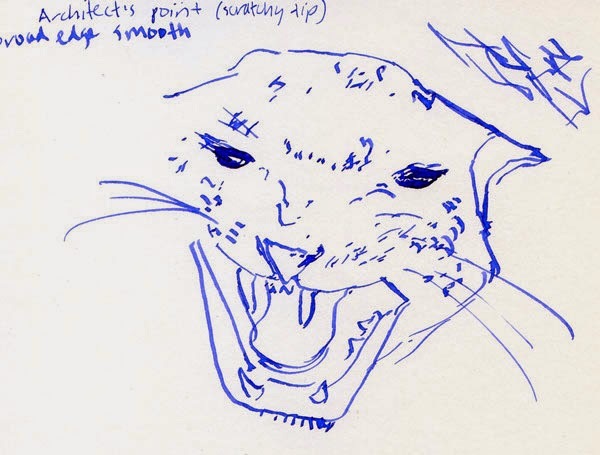 This happened a few times on early sketches, though not so badly that the sketches were ruined. The obvious solution would be to use a hot press paper or other paper with a smoother texture. 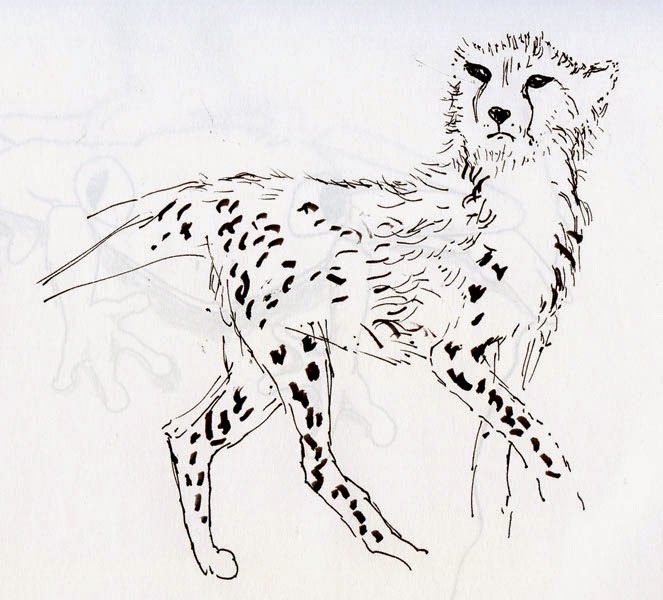 Or I could decide that ink splatters give a sketch some organic character, which I’m not opposed to. I’ve decided that the nib’s potential for splattering is something to be aware of but not a deal breaker. Aside from differences in line variation, I’d say the main difference between the Sailor fude and the Pilot Falcon is the hand movement requirement to get that variation. It took me quite a while to get used to the forward-and-back angle change of the fude nib, but now that I am used to it, the motion comes naturally to me. 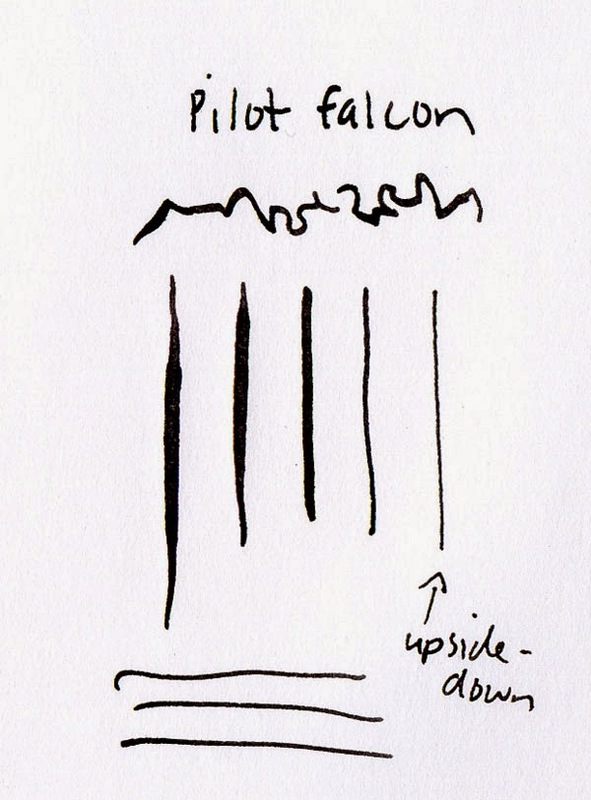 Though it seems like it should be intuitive (if I push harder on a crayon, I get a darker, broader stroke), the Falcon’s reliance on pressure to change the line width is still taking me a bit of time to learn, and it’s not quite second nature yet. I might have a different review after I’ve used the Falcon for a year or more. But will I? The line variation I get from the Sailor is wider, and my trusty favorite uses considerably less ink. The jury is still out on the Falcon. But have you heard of the “calling the dog” concept? I’m hazy on its origin, but apparently it’s a story about two people who both claimed a dog as their own, so they both called to it, and let the dog choose. 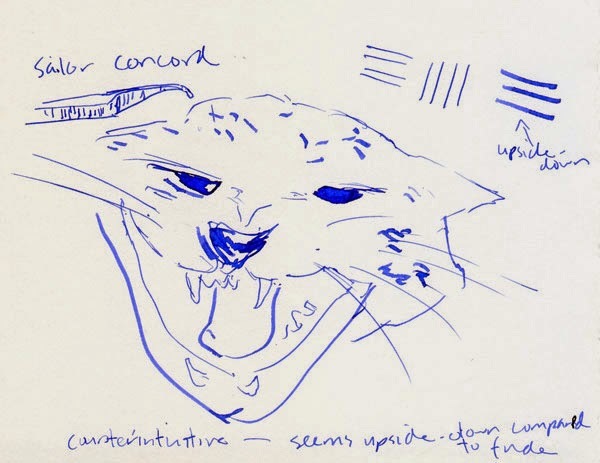 The concept (as applied to real-life situations, not a hypothetical dog) is that if you are trying to decide among a few things, and evaluating their various attributes objectively has caused confusion, one way to choose is to stop analyzing and just see which one you tend to go to intuitively. In other words, you are the dog, and you “choose” the one that calls to you in some way. 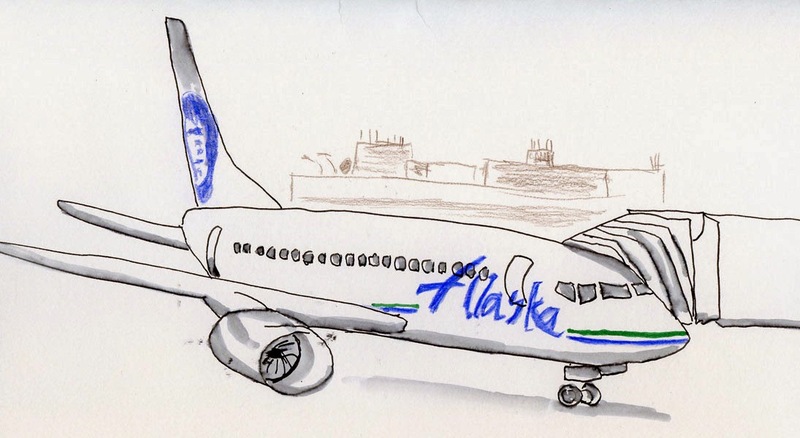 I have been carrying around the Pilot – along with the other pens I’ll be reviewing in this series – in my bag for the past couple of months, and I’m finding that, more often than not, the Pilot is the pen I grab first. Well, I have to condition that: I grab it first as long as my Sailor fude is not in my bag. (I’ve lately left it at home to give the other pens a fair trial.) But among the pens I’m testing, especially when I have limited time and need a pen I can count on quickly and with no nonsense, this dog often chooses the Pilot. Now what about that music nib. . . ? (stay tuned next week). You know from my Epic Pen Search and Discovery series that I’ve been trying out a lot of unusual fountain pen nibs lately. 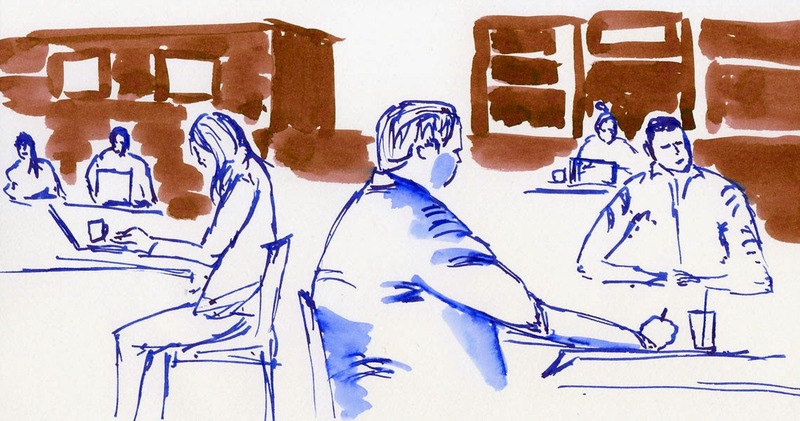 I brought a couple to Zoka Coffee yesterday, because one of my favorite uses of a variable-line-width pen is sketching people (others are trees and animals). You’ll be hearing more about these pens in full reviews I’ll be writing within the next few weeks, but you can consider these sketches a teaser. 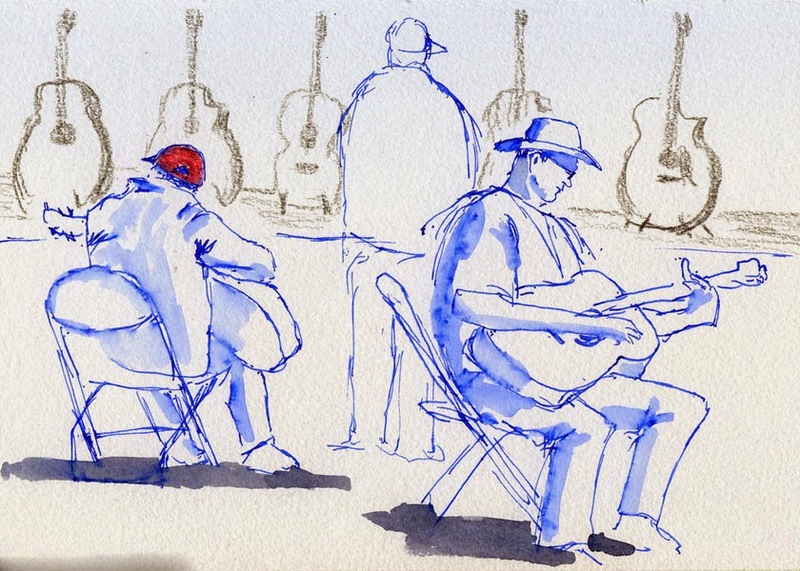 The people in the blue and brown sketch below were done with a Platinum music nib. 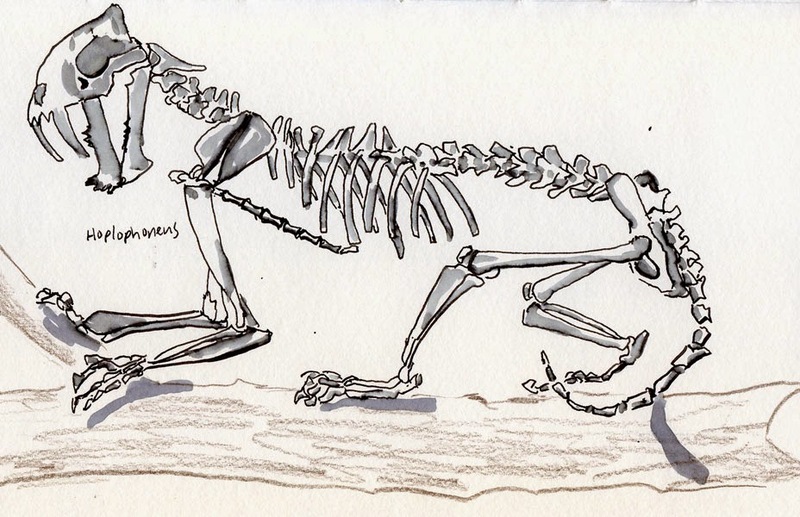 Too broad for details, this pen forces me to be faster and looser. More on these and other pens coming soon!